In this series, we’ll explain each of Kinedu’s four areas of development. Keep reading to find out what you can expect from your baby’s development in the first years! Babies are a lot like little scientists –actively testing the world to figure out how it works. A baby’s cognition –or the group of mental processes that include abstract thinking, memory, problem solving, and attention– helps create this understanding of the world. One of the first big leaps your baby will take is developing a sense of agency, or the fact that he can make things happen. This is tied with understanding cause and effect –again, pretty important when it comes to making some sense of how the world works. By the time your baby’s first birthday comes around, he’ll have a pretty good grasp on the fact that people and things still exist even when he can’t see them. You’ll notice this breakthrough in object permanence when he starts to find toys when they are hidden from sight. This will make Peek-a-boo a little outdated, but hide-and-seek will become so much more fun. At around this same period, your baby’s attention span will increase a good amount. Although he’ll still move around a lot, he might stay interested in a toy for a whopping 15 minutes. Not bad, compared to the two minutes it took him to get bored a couple of months back. You can gradually expand the toys and objects he’s familiar with to keep him interested, but it’s likely that he’ll be able to find these objects himself as he turns your home inside out. This random play is his way of learning about the world, and is important for his cognitive development. To keep him safe, make sure there’s nothing dangerous that he could get his hands on –he’ll put anything he finds in his mouth. However, encourage this playtime, as it will help construct his ideas about textures, shapes, gravity, and how the world works! In the first few years, your child will have an insatiable curiosity, and will be looking for new things to conquer. He’ll show an increased ability to process information, remember, and conceptualize –all part of the cognitive growth that is taking place in that rapidly developing brain of his. 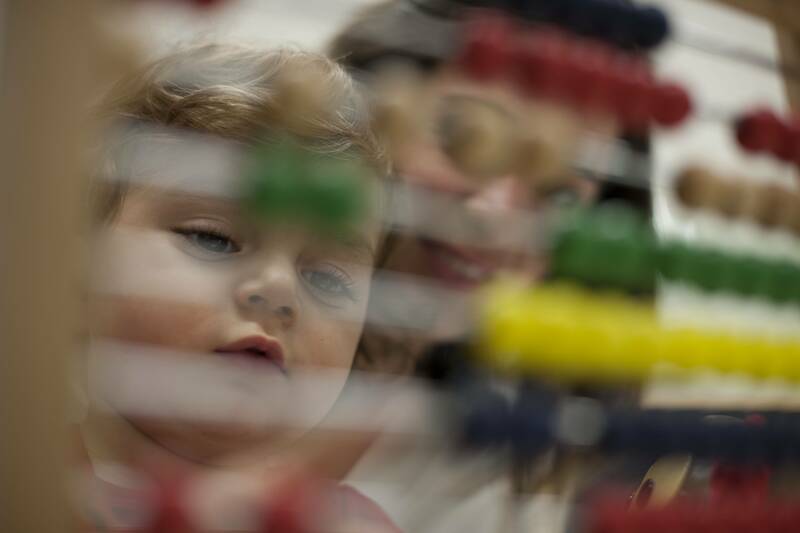 Strengthen his development by carrying out Kinedu’s Cognitive activities that target shape, space, and measure; artistic expression and creativity; or reasoning skills. Here’s one of our favorites –let us know what you think! Babies are a lot like little scientists – actively testing the world to figure out how it works. A baby’s cognition – or the group of mental processes that include abstract thinking, memory, problem solving, and attention – helps create this understanding of the world.